branding is extremely important to growing a business. it`s actually my ultimate favorite part about having a business. creating and narrating a story that people can relate to is vital because you`re creating a community for people who love your brand. they will support you for what you represent and that sense of closeness that they feel to your brand, not just the service or products that you offer. when i first created my business cards, they were rushed so that i could promote my work for my upcoming art shows. now that i`ve had time to really sit down and brainstorm concepts, i came up with a visual representation that truly tells my story without words. it`s witty and creative. most of all, it`s me. the feedback that i received on these little babies have been super positive, so i am really happy that i set the time aside to give them a fresher look. 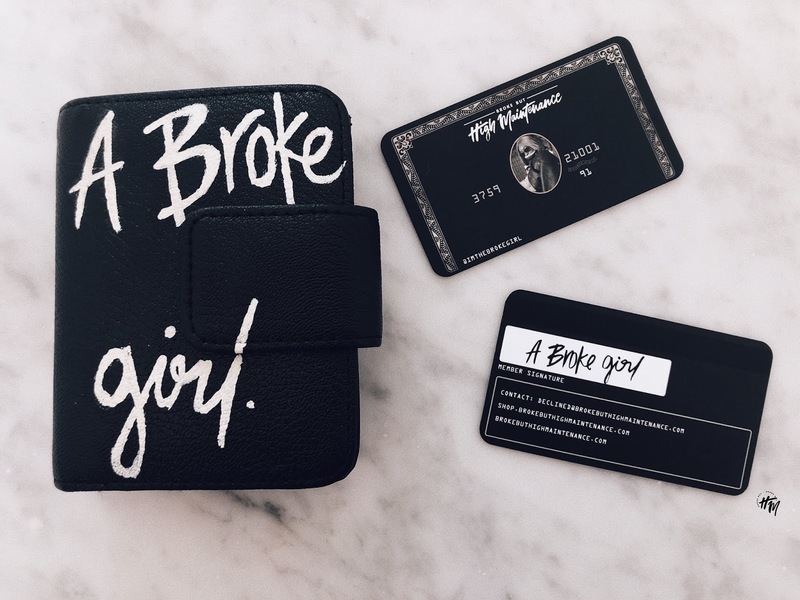 for my broke girls, there are so many free outlets that you can use to create business cards. for example, Canva is a free, cool app that provides free editing on templates so that you can make them your own. Canva has pretty much everything you need to create amazing content, as well. You can also download free trials of Photoshop and play around with the functions. Watch a few YouTube tutorials to get you started and then upload your design to a printing site (I enjoy using Moo). I am sure there are way more out there! So what are you waiting for? also, pictured above is my wallet, which follows my "broke" theme and keeps my brand story consistent. i always carry a part of my brand with me everywhere i go. if i am not wearing my tee or crewneck, i have my phone case and wallet. i wear my dad hat almost everyday. i just think it makes every look perfect. i`m working on making my brand more wearable for others, not just me.